Today, January 18th has been declared Internet Freedom Day by internet users and supporters all around the U.S. Why is this important? Because we have to protect the FREEDOM TO CONNECT. When SOPA and PIPA were first introduced in Congress, things looked grim for the internet. Widespread censorship seemed imminent, and Internet supporters everywhere were worried about the massive blow that was about to be dealt to freedom. The Innovation Policy Summit is live from CES this week and if you’re not in Las Vegas you can still check out the panels being streamed right here courtesy of our friends at the Consumer Electronics Association and The Innovation Movement. Watch these important panels on issues affecting innovation including the technology economy, e-waste, pro-innovation policy, facial recognition, job creation, mobile, patents and copyrights [featuring our own Hank Shocklee on the panel - Beyond SOPA: Creating a Pro-Innovation, Pro-Artist Copyright Policy - Tuesday, January 8th at 2:00pm PST]. If you’re in town for the show, make sure to stop by! One year ago, a digital sleeping giant suddenly awoke. Millions of Americans called, emailed, and wrote their members in Congress in defense of Internet Freedom. The ground had shifted, and Washington would never be the same. 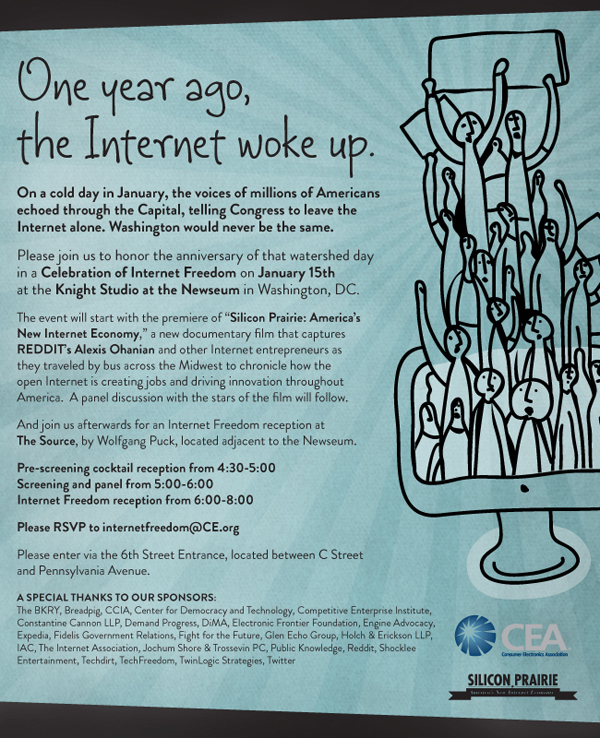 To mark the anniversary of this great moment, The Celebration of Internet Freedom will take place on January 15th at the Newseum in Washington, D.C.